The algorithm that we use in our practice to diagnose and treat tinnitus is here (a PDF graphic). After a diagnostic step, there are many branch points involving treatment trials. The bottom line is that it is unusual (although not impossible) for people to get substantial relief from medication, devices, or surgery. In fact, "obsessing" about tinnitus, generally tends to make it more persistent and worse. Thus paradoxically enough, doctors tend to discourage reading of web pages like this one, or joining of support groups. Most people "get used" to tinnitus, and learn to "tune it out". When this doesn't happen, the treatments that work the best for tinnitus are those that alter ones emotional state -- antidepressants and antianxiety drugs, and ones that allow you to get a full night's sleep. Pan et al (2015) reported in a survey of 258 patients with tinnitus, that 38% reported that noise made tinnitus better, and 15% that relaxation made it better. Things that made it worse included being in a quiet place (48%), stress (36%), being in a noisy place (32%), and lack of sleep (27%). Only a few patients reported that coffee/tea or foods made their tinnitus worse. The bad news in more detail : Dobie (1999) reviewed the 69 randomized controlled trials of tinnitus treatments. According to Dr. Dobie, no treatment can yet be considered "well established" in terms of providing replicable long-term reduction of tinnitus impact, in excess of placebo effects. Support and counseling are probably helpful as are tricyclic antidepressants in severe cases. Benzodiazepines, newer antidepressants and electrical stimulation deserve further study. More recently, Hoare et al (2011) reviewed 28 randomized controlled trials. They concluded "The efficacy of most interventions for tinnitus benefit remains to be demonstrated conclusively. In particular, high-level assessment of the benefit derived from those interventions most commonly used in practice, namely hearing aids, maskers, and tinnitus retraining therapy needs to be performed." Antidepressants were the only drug class to show any evidence of potential benefit. But don't lose all hope: Dobie made the point that tinnitus is likely multifactorial, and the usual study design is likely not well chosen for this situation. A study design where initially an open-label study is performed, followed by a randomized placebo controlled trial might find patient groups that respond to a medication. This seems very logical. If a specific cause for tinnitus is found, then your physician may be able to eliminate the noise. Examples of specific causes include medication, tumors, infections, Meniere's disease, TMJ and otosclerosis. Tinnitus due to the tensor tympani can be treated by transection of that muscle. To find a specific cause it may require a fairly extensive workup including X-rays and blood tests. However, even after extensive workup, most causes of tinnitus go undiagnosed. If a specific cause of tinnitus is not found, it is unlikely that the tinnitus can be gotten rid of. At best, one might get partial relief from some of the strategies to be described in the next few paragraphs. However, even though treatment may not be available, tinnitus should be checked into, as tinnitus may be a warning sign of a serious disorder such as a tumor of the 8th nerve, or other disorder which may impair hearing. Tinnitus does tend to gradually get better, but many persons with severe tinnitus still experience distress 5 years later. Tolerance of tinnitus increases with time. (Andersson et al, 2001). Medications may occasionally help lessen the noise even though no cause can be found. In general, we are not at all enthused about medication treatment as the side effects can be substantial and the results are often unimpressive. In randomized clinical trials, for the most part, the agents under study have failed to demonstrate elimination of tinnitus more frequently than have placebos (Dobie RA, 1999). Medication to deal with the psychological fallout of tinnitus is often useful -- antidepressants and anti-anxiety medications can be very helpful. This is because of the very high correlation between anxiety and depression with tinnitus-related annoyance and severity (Pinto et al, 2014). We are not suggesting here that anxiety/depression causes tinnitus -- but rather that tinnitus is associated with some treatable psychiatrical disturbances. Amitriptyline or nortriptyline (again in low doses). These are "tricyclic antidepressants". Robinson (2007) reviewed use of antidepressants for tinnitus. At that date there were 4 double-blind placebo controlled trials of antidepressants for tinnitus. Three out of four trials resulted in a favorable outcoume (Nortriptyline, Paroxetine, Sertraline). The fourth trial of Trimipramine reported an 8dB increase. Robinson reported that tinnitus in depressed patients appears more responsive to antidepressants than in non-depressed patients. Mechanisms for impovement were suggested to be direct effects of increased serotonin on auditory pathways, or indirect effects of tinnitus on depression or anxiety. We have also had some patients get relief from other antidepressants including the SSRI family and SNRI family, and especially with low dose venlafaxine, which we find helps in reducing central sensory syndromes such as allodynia as is found in migraine headache. The anticonvulsants such as mysoline may affect some patients who have tinnitus due to 8th nerve irritation. Mysoline (Primidone) contains phenobarbital, which is sedating. On the other hand, Hoekstrat et al (2011) suggested that in general these drugs do not work for tinnitus. This is not very surprising. There is a small literature concerning use of intravenous and local anesthesia for tinnitus. See this link for more. Lainez and Piera (2007) reviewed a paper published concerning use of Botox for tinnitus. Stidham et al (2005) injected botox into the area of the ear(above, and 2 places behind), the arm, and compared with placebo. This study suggested that Botox might improve tinnitus to a small extent (7 improved with active, 2 improved with placebo). Lainez and Piera suggested that the mechanism was reduction of peripheral inputs from cervical, temporal, frontal and periauricular pathways. Liu et al (2011) reported use of botox for tinnitus due to tensor tympani myoclonus, by inserting gelfoam with botox through a perforation in the tympanic membrane. This method appears to us to be overly invasive. Eperisone (not available in US, we have no idea). Trimetazidine. (not available in US, probably not). Campral, is a medication FDA approved for treatment of abstinent alcoholics. A paper from south America reported that it is effective for tinnitus. This is an off-label use of this medication. At this writing (4/09), we think it is ineffective. Because it is easily available in the US, and has a rather benign side effect profile, we think that it is a good candidate for medication trials. We have had no success with it in a few patients. Pramipexole was recently reported effective for tinnitus in a study of 40 patients with age related hearing loss in Hungary. (Sziklai and others, 2011). It seems very unlikely to us that a dopamine agonist should be useful in tinnitus. This work needs to be confirmed by others. Anticonvulsants. According to Hoeksra et al, there is no evidence that anticonvulsants have a "large positive effect" on tinnitus, but a small effect (of doubtful clinical significance) has been demonstrated. They reviewed studies of gabapentin, carbamazepine, lamotrigine and flunarizine. (We were not aware flunarizine was an "anticonvulsant", and it is not approved in the USA for any clinical use). Canis M, Olzowy B, Welz C, Suckfüll M, Stelter K.Simvastatin and Ginkgo biloba in the treatment of subacute tinnitus: a retrospective study of 94 patients. Am J Otolaryngol. 2011 Jan-Feb;32(1):19-23. Epub 2009 Oct 31. Shim et al (2011) reported that for acute subjective idiopathic tinnitus, the combination of alprazolam and intratympanic dexamethasone injections was significantly higher (75%) than treatment with alprazolam alone (50%). As it would be difficult to placebo control an intratympanic treatment, we think that this conclusion needs confirmation. Common sense would suggest that if medications generally are ineffective for tinnitus, dietary supplements should be even less likely to work. Examples of these are Ginkgo biloba, lipoflavonoids, magnesium, melatonin, viamin B12 and zinc. Coelho et al (2016) reviewed 1788 subjects who responded to a website on tinnitus, and reported that " Adverse effects were reported in 6% (n = 36), including bleeding, diarrhea, headache, and others. Supplements were reported to be helpful for sleep: melatonin (effect size, d = 1.228) and lipoflavonoid (d = 0.5244); emotional reactions: melatonin (d = 0.6138) and lipoflavonoid (d = 0.457); hearing: Ginkgo biloba (d = 0.3758); and concentration Ginkgo biloba (d = 0.3611)." Although the design of this study (web survey) is disturbing, as one would think there would be potential bias regarding the people who visit these sorts of forums, and an intrinsic inabilty to measure the quantity that they are studying, this is not very encouraging. It would be difficult to see how lipoflavonoids could affect sleep or emotion -- perhaps this relates to the efficiency of the marketing material for this preparation. Overall, we can see some reason to melatonin for sleep, and magnesium for headache. Hearing aids and other devices called "maskers" may also help alleviate tinnitus. While Hearing aids are often recommended as treatment of tinnitus, according to Hoare(2014) from the Cochrane Databse, the quality of evidence for their effect is so poor that no conclusion can be made. That being said, we think If you have tinnitus associated with a hearing loss, a hearing aid is a reasonable thing to try. Be sure that you try the hearing aid before buying one, as tinnitus is not always helped by an aid. We see no reason to get 2 hearing aids at the same time, for treatment of tinnitus. Nearly all states mandate a 1-month money-back guarantee built into hearing aid dispensing. This is because these devices are expensive, and don't always work. It also seems possible that a hearing aid might exacerbate tinnitus, as many people develop "ringing" of their ears after exposure to loud noise. Cochlear implants, which are used for severe bilateral unaidable hearing loss, usually improve tinnitus (Amoodi et al, 2011). We are generally in favor of maskers (see below). We try masking in almost all patients in our clinic. These are devices based on the idea that tinnitus is usually worst when things are very quiet. Listening to the interstation static on the FM radio, tapes of ocean surf, fans, and the like may be helpful. Pillow speakers sold by Radio Shack may be helpful in order to avoid disturbing others. There are numerous "apps" available on smartphones that implement masking. This is a very cheap method. Tinnitus maskers are devices fitted and sold by audiologists. Controlled studies of maskers have shown small effects (Dobie, 1999). Given that smartphone apps do the same thing as tinnitus maskers, and that most newer hearing aids are blu-tooth capable, we see little reason to pay for a masker-hearing aid when one already owns a cell phone. 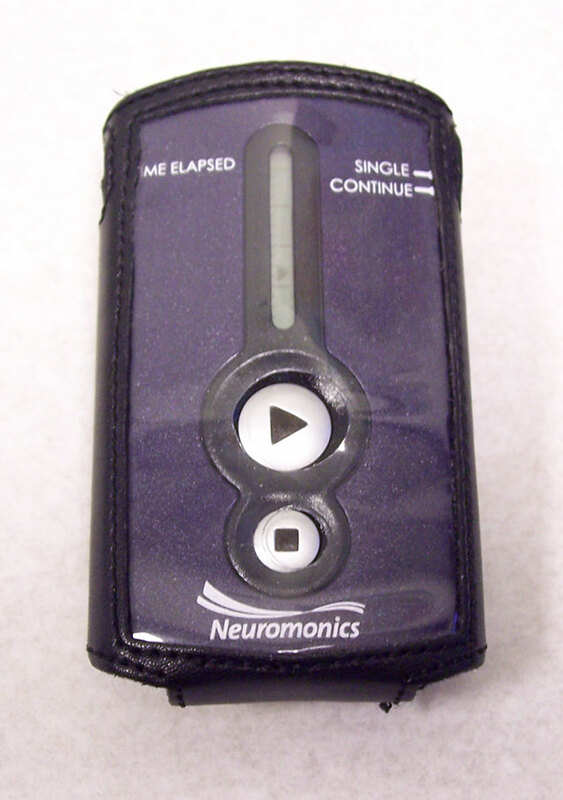 Unusual devices advocated for tinnitus. A discussion of the Neuromonic's masking device can be found by clicking on the link above. Briefly, we think that smartphone apps are a much more efficient method of doing much the same thing. TENS -- electrical stimulation of ear and surrounding region. Tinnitus is often modulated by somatic input such as jaw movement. It would make sense that electrical stimulation might also modulate tinnitus. There is a small literature with some positive and negative data. This area seems to us worthy of more research. TMS -- transcranial magnetic stimulation. This is an investigational approach, which presently seems slightly promising. TMS involves brain stimulation using very high intensity magnetic pulses. It is somewhat similar to a "gentle" electroshock treatment, and clearly works on the brain rather than the inner ear. TMS seems to be somewhat helpful for depression and migraine, and one would think that a modality that worked for these, would also work to some extent for tinnitus. There is presently some evidence that it is helpful (Smith et al, 2007; Kleingjung et al, 2007; Mennemeier et al, 2008; Bilici et al, 2013) as well as studies suggesting it is no better than placebo (Piccirillo et al, 2011). This treatment is available only in persons who are in research environments, or those with refractory depression. We are cautiously optimistic about TMS, especially in individuals with depression. Electrical stimulation of auditory cortex. Friedland and associates (2008) reported results of brain electrical stimulation in 8 patients. This was an uncontrolled study. The authors concluded that this technique "warrants further investigation". Two patients had persistent improvement of pure tone tinnitus, and 6 had short periods of suppression. This seems very drastic to us. Ablahi et al (2018) reported transcranial direct current stimulation in 51 patients, divided into 3 groups (cathode, anode, control). They were treated with weekly transcranial electrical stimulation. They reported that "The mean score of tinnitus in the anodal stimulation group was significantly lower than the control; whereas, no significant difference was observed between the anodal and cathodal stimulation groups, and between the cathodal and control groups (p < .05). Findings also showed that the mean scores of tinnitus in two cathodal stimulation groups (p = .24) and control group (p = .62) were not significantly different at three different points of time; whereas, this score was significantly different in the anodal group at these time points (p = .01)." In spite of thos positive report, we think that this is a placebo treatment, as we cannot envision any reasonable mechanism for electrical current applied to the scalp, once/week, could do anything other than create a placebo effect. We speculate that perhaps the control patients realized that nothing was happening. There are numerous devices and medications for tinnitus that are probably placebos. See this page for more discussion. If a placebo works for you - - that's wonderful ! Surgical treatment of tinnitus: surgery is rarely indicated for tinnitus. Again, bad news. Surgery should be considered when there is a clear structural reason for tinnitus that can be improved with surgery. It is also worth considering if hearing can be improved by surgery. Generally though, hearing aids or implantable devices are much more successful than surgery. A very rare example of surgically treatable tinnitus is tinnitus due to a tumor. Venous tinnitus is tinnitus due to a venous source (usually pulsatile in this situation). For venous tinnitus, possibilities include jugular vein ligation, occlusion of the sigmoid sinus, or closure of a dural fistula. Surgery may also be an option to consider if your diagnosis is otosclerosis, or fistula . Cochlear nerve section is reported effective in 50%, with the inevitable consequence of irreversible deafness. Occasionally persons with Meniere's disease have relief or reduction of tinnitus from transtympanic gentamicin. Microvascular compression syndrome, in theory, may cause tinnitus, but we have had very little success when the few patients we have seen with this syndrome have undergone surgery. Shunt surgery for hydrocephalus, may be helpful for this very rare cause. Rarely 8th nerve sections are done for tinnitus. They are successful in about 50%, with the price of losing hearing in 100%. Surgery seems worth considering only in extreme situations - -the tinnitus is extremely loud, very distressing, and there is a methodology to decide whether or not the tinnitus can be improved with surgery. If tinnitus is reduced by intratympanic lidocaine injection, it seems reasonable to us that surgical treatment may also be effective (for unilateral tinnitus). Tinnitus usually improves in profoundly deaf individuals who undergo cochlear implantion (Olze, 2015). This is very logical as sound is generally the enemy of tinnitus. On the other hand, very few individuals with tinnitus are deaf enough to qualify for cochlear implants. Often, anxiety or depression which accompanies tinnitus may be as big a problem as the tinnitus itself. In this instance, consultation with a psychologist or psychiatrist expert in this field may be helpful. In addition, some types of psychotherapy aim to confront tinnitus thinking head-on -- a sort of society sanctioned "brain washing". These are treatments in the genre of "cognitive behavioural therapy" -- or CBT for short. We think -- whatever works ! Thompson et al (2016) reviewed 64 "records", presumably articles largely, and reported "The most frequently reported psychological therapies were cognitive behavioral therapy, tinnitus education, and internet-delivered cognitive behavioral therapy." That being said, in Thompson "Records were excluded in which the intervention included biofeedback, habituation, hypnosis, or relaxation as necessary parts of the treatment." So in other words, this review excluded most of the common treatments such as TRT and essentially is just stating that psychologists seem to prefer to use their most popular tool -- CBT. Nyenhuis et al (2013) and Martinez-Devesa concluded in systemic reviews that CBT was helpful as well. Getting psychotherapy for tinnitus is not so easy though as very few counselors specialize in tinnitus, and patients often know more than their clinicians. The "no discussion treatment" approach has some positives too -- if you can ignore tinnitus rather than obsess about it, this may be the best way to handle it rather than participating in psychological treatments that involve discussing one's tinnitus for an hour every week. Rationally, the choice of treatment should depend on personality style and ones ability to suppress unwanted thoughts. CBT (cognitive behavioral therapy) is presently favored by the counselors (see above). However, we think that this should be combined with rational use of medications (such as antidepressants and sleep medication), so a counselor should not be attempting to "go it alone", at least in severe situations. Hypnosis may be effective and increase tolerance to tinnitus, but randomized controlled trials are not encouraging (Dobie, 1999). Internet based psychological treatments have been available for about 15 years, and have considerable promise (Andersson et al, 2015). This is another method of delivering CBT. Medications that help people with obsessive compulsive disorder (such as the SSRI family) may be helpful. While we rarely send patients for conselling right now in our clinical practice, we do favor prescribing a simple SSRI (such as citalopram) and and a weak anxiety/sleep medication (such as klonazepam) for persons with acute and "catastrophic" tinnitus, as these people can be sleep deprived, anxious, miserable and depressed. This is aimed both at improving sleep and reducing anxiety, as both of these factors make tinnitus even worse. We aim to stop the medication in most in 3 months. Tinnitus Retraining Therapy (TRT) is a method of treating tinnitus helpful for some (Wang et al, 2003). It requires a considerable commitment of time, and health insurance in the USA considers it to be a type of psychotherapy. TRT combines counseling and sound therapy. Sound therapy (masking) can now be obtained through cellphone "apps", and thus the main value of the TRT program as of 2015 is mainly the psychotherapy piece as well as oversight by an experienced practitioner. According to the inventor of TRT, Jastreboff, the goal of counseling is to reclassify tinnitus into the category of a neutral stimulus. This would seem a bit similar to CBT. The goal of sound therapy is to decrease the strength of tinnitus-related neuronal activities (Jastreboff, 2015). Of course results are what count. Jastreboff stated that "The majority of these publications indicate TRT offers significant help for about 80 % of patients." Other reviews are less enthusiastic however. We sometimes refer patients for TRT, but difficulty finding a practitioner, the time required and general lack of health insurance support for what is essentially long term psychotherapy are significant barriers. What to do if you have tinnitus ? Avoid exposure to loud noises and sounds, avoid environments that are very quiet (as this makes tinnitus more noticeable). Aim for a low-normal intake of salt. Exercise daily, get adequate rest, and avoid fatigue. Avoid ototoxic medications known to increase tinnitus such as aspirin, non-steroidals and quinine containing preparations. Diet: We recommend that persons with tinnitus limit salt (no added salt), and refrain from drinking caffeinated beverages, other stimulants (like tea), and chocolate. The salt restriction is intended for those who might have a subclinical form of Meniere's. Caffeine and similar substances increase tinnitus in a nonspecific fashion. Otherwise the diet should be balanced and have normal amounts of fruits and vegetables. Alternative medicine approaches. Ginkgo-Biloba, betahistine (Serc), Zinc, and acupuncture are sometimes advocated as treatment for intractable tinnitus. There is little evidence that these agents work, but they also do not seem to be harmful. More discussion about alternative medications for Meniere's disease is available here. Self Help: You might consider joining the American Tinnitus Association. (PO Box 5, Portland, OR 97207, 503-248-9985). However, if your tinnitus has been well "worked up", and there is nothing more to be done, it might be best to attempt to ignore it rather than focus more attention on it. Joining of these sorts of organizations intrinsically draws more attention to ones illness. References: We have provided links to our journal quality page, for journals with unusually low scores. Andersson G.Clinician-Supported Internet-Delivered Psychological Treatment of Tinnitus. Am J Audiol. 2015 Sep 1;24(3):299-301. doi: 10.1044/2015_AJA-14-0080. Araujo MF and others. Intratympanic dexamethasone injection as a treatment for severe disabling tinnitus. Arch Otol HNS 2005:131:113-117. Coles, R. R., A. C. Thompson, et al. (1992). "Intra-tympanic injections in the treatment of tinnitus." Clin Otolaryngol Allied Sci 17(3): 240-2. Dobie RA. A review of randomized clinical trials in tinnitus. Laryngoscope 1999;109(8):1202-11. GHOSSAINI SN, Spitzer JB, Mackins CC, Zschommler A, et al. High-frequency pulsed electromagnetic energy in tinnitus treatment. Laryngoscope 2004;114:495-500. Hesse G, Schaaf H. [Ginkgo biloba: ineffective against tinnitus?] HNO 2001; 49: 434-6. Hoare DJ, Kowalkowski VL, Kang S, Hall DA.Systematic review and meta-analyses of randomized controlled trials examining tinnitus management. Laryngoscope. 2011 Jul;121(7):1555-64. doi: 10.1002/lary.21825. Epub 2011 Jun 10. Holmes and Pagdham. Review aper: more than ringing in the ears: a review of tinnitus and its psychosocial impact. J. Clin Nursing 18,2927-2937, 2009 (This is a low-scoring journal in SCOPUS). Jastreboff PJ. 25 Years of tinnitus retraining therapy. .HNO. 2015 Apr;63(4):307-311. Kleinjung T, Steffens T, Sand P, Murthum T, Hajak G, Strutz J, Langguth B, Eichhammer P. Which tinnitus patients benefit from transcranial magnetic stimulation? Otolaryngol Head Neck Surg. 2007 Oct;137(4):589-95. Lainez, M. J. and A. Piera (2007). "Botulinum toxin for the treatment of somatic tinnitus." Prog Brain Res 166: 335-338. Liu, H. B., et al. (2011). "Botox transient treatment of tinnitus due to stapedius myoclonus: case report." Clin Neurol Neurosurg 113(1): 57-58. Piccirillo JF, Garcia KS, Nicklaus J, Pierce K, Burton H, Vlassenko AG, Mintun M, Duddy D, Kallogjeri D, Spitznagel EL Jr.Low-frequency repetitive transcranial magnetic stimulation to the temporoparietal junction for tinnitus Arch Otolaryngol Head Neck Surg. 2011 Mar;137(3):221-8. Robinson, S. (2007). "Antidepressants for treatment of tinnitus." Prog Brain Res 166: 263-271. Schecklmann M1, Landgrebe M2, Kleinjung T3, Frank E1, Rupprecht R1, Sand PG1, Eichhammer P1, Hajak G2, Langguth B1. State- and trait-related alterations of motor cortex excitability in tinnitus patients. PLoS One. 2014 Jan 7;9(1):e85015. doi: 10.1371/journal.pone.0085015. eCollection 2014. Shim HJ, Jun Song S, Choi AY, Hyung Lee R, Won Yoon S. Comparison of various treatment modalities for acute tinnitus. Laryngoscope. 2011 Dec;121(12):2619-25. doi: 10.1002/lary.22350. Smith JA, Mennemeier M, Bartel T, Chelette KC, Kimbrell T, Triggs W, Dornhoffer JL.Repetitive transcranial magnetic stimulation for tinnitus: a pilot study. Laryngoscope. 2007 Mar;117(3):529-34. Stidham, K. R., et al. (2005). "Evaluation of botulinum toxin A in treatment of tinnitus." Otolaryngol Head Neck Surg 132(6): 883-889. Sziklai I, Szilvássy J, Szilvássy Z. Tinnitus control by dopamine agonist pramipexole in presbycusis patients: A randomized, placebo-controlled, double-blind study. Laryngoscope. 2011 Apr;121(4):888-93. doi: 10.1002/lary.21461.